Azerbaijan has a large basalt deposits, Yifan Machinery Azerbaijan customers to build the the basalt gravel production line has started operation of 1500t / h production. Basalt characterized by high hardness, are difficult to broken rock. Yifan Machinery configuration PE jaw crusher, hydraulic cone crusher and stone at stone vertical shaft impact crusher combination of production, excellent grain production capacity of 1500t / h, gravel 20 hours a day continuous operation, mechanisms sand. All finished products have to undergo a vertical shaft impact crusher plastic products flakiness content not higher than 5%, and fully meet the road surface asphalt concrete with gravel quality standards. Vertical shaft impact crusher, impact crusher has the role of particle shaping, jaw crusher and hammer crusher simply broken and not have this shaping role, coarse aggregate produced by jaw or hammer crusherflakiness content, particle-particle type is not good, poor grading, so when the production of basalt hard abrasive rock coarse aggregate should be adopted before the two processes, but plastic suitable for low abrasive rock crusherPlastic is far less than the basalt hard abrasive rock vertical shaft impact crusher, aggregate for asphalt macadam the Mastic (SMA) must be vertical shaft crusher plastic. 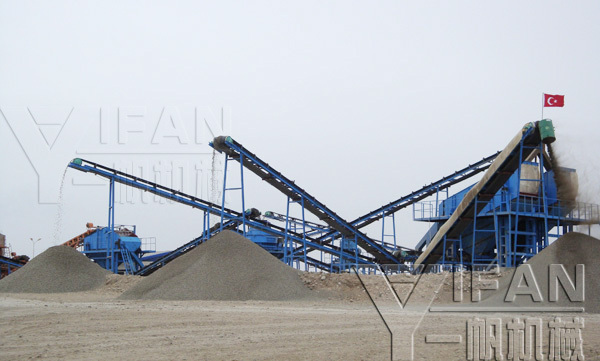 Yifan Machinery production units of basalt crusher jaw crusher, cone crusher, vertical shaft impact crusher tertiary crushing combined process production products fully meet the requirements of the asphalt concrete pavement basalt technical standards.